Photo courtesy of Tourism Western Australia. Feeling beige or gray about your travel plans (or lack thereof)? Seek out colorful natural wonders — unusual hues in unlikely places please all the senses. 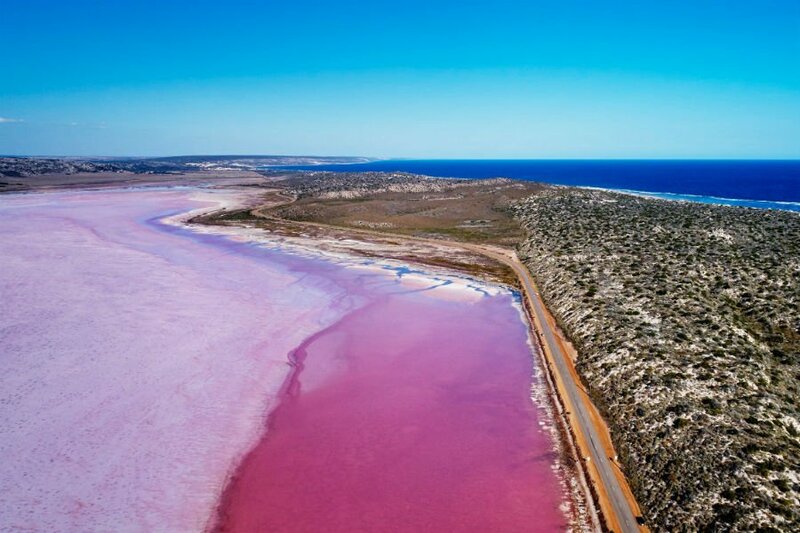 An extremely high level of salinity gives the Australian lagoon its spectacular color, which varies from bubblegum pink to peach to lilac depending on the time of day and the time of year. From Perth, the drive is six hours along Indian Ocean Drive; it's a 30-minute drive from Kalbarri. For a truly unique perspective, fly in from Geraldton, where you'll get the chance to see the lagoon in contrast to the blueness of the Indian Ocean. Pick up provisions at the picturesque fishing village nestled between the lagoon and the beach, Port Gregory's general store, and settle into a camper, cottage, or roadside inn to take in the stunning scene. Tourism Western Australia has a few nice resources to help you round out your trip. 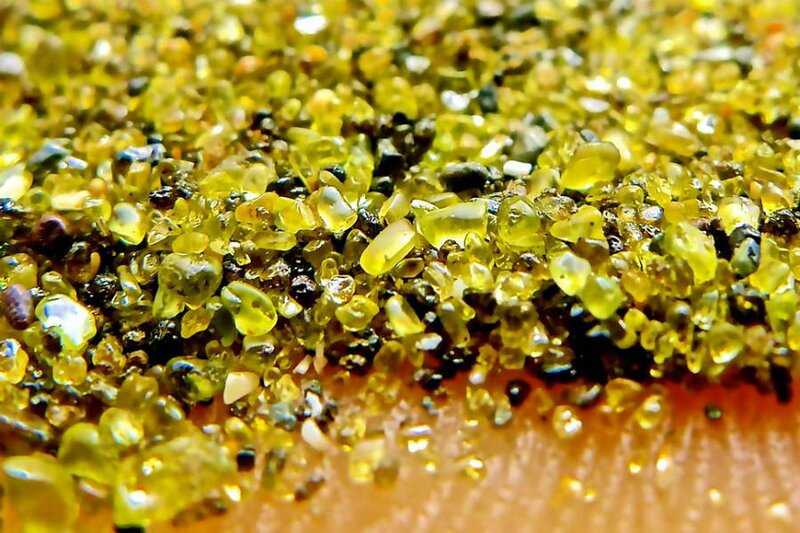 Tiny green crystals on Papakōlea Beach. Photo courtesy of Love Big Island. It's hard to reach, but the verdant shores of the Big Island's hidden cove are carved from ancient volcanic stone containing green crystals (olivine) that give the beach an earthy hue. The hike to and from is about five miles, so pack a picnic and plenty of water, and prepare for excellent snorkeling in a calm bay nearly all to yourself. Love Big Island has step-by-step directions. Laguna Colorada, Bolivia. Photo by @dolorsbas / Instagram. Bolivia's Salar de Uyuni is one of the most extreme landscapes in the world. 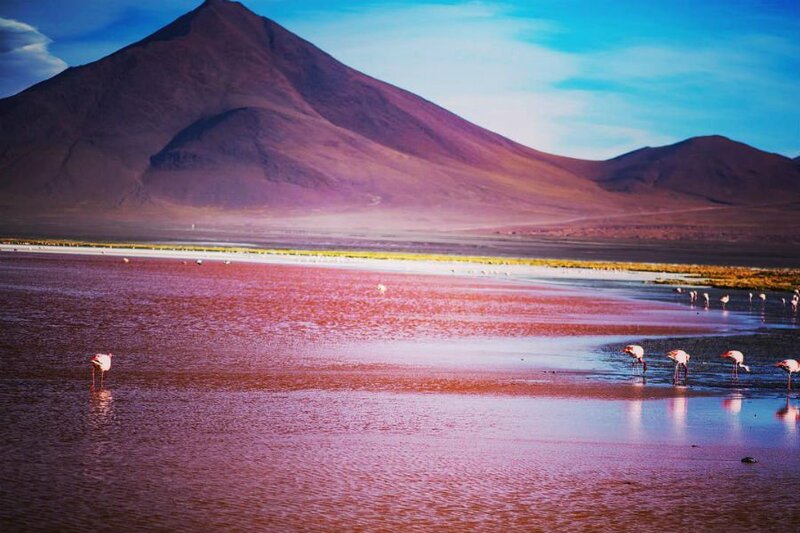 The largest salt flat on Earth, a result of the evaporated residuals of prehistoric lakes near the crest of the Andes, it is 12,000 feet above sea level and incredibly rich in minerals that leave colored deposits in lakes and hot springs and draw an extremely rare breed of pink flamingo. Laguna Colorada's micro-organisms and algae make the water a deep rusty red mixed with blue, and borax deposits leave bright white islets. The landscape — crimson water, blue sky, white snow-capped mountains — is otherworldly. A handful of tour operators can get you there, ranging from the rugged (Intrepid Travel) to the posh (Abercrombie & Kent). True blue at Havasu Falls. Photo courtesy of Havasupai Reservations. 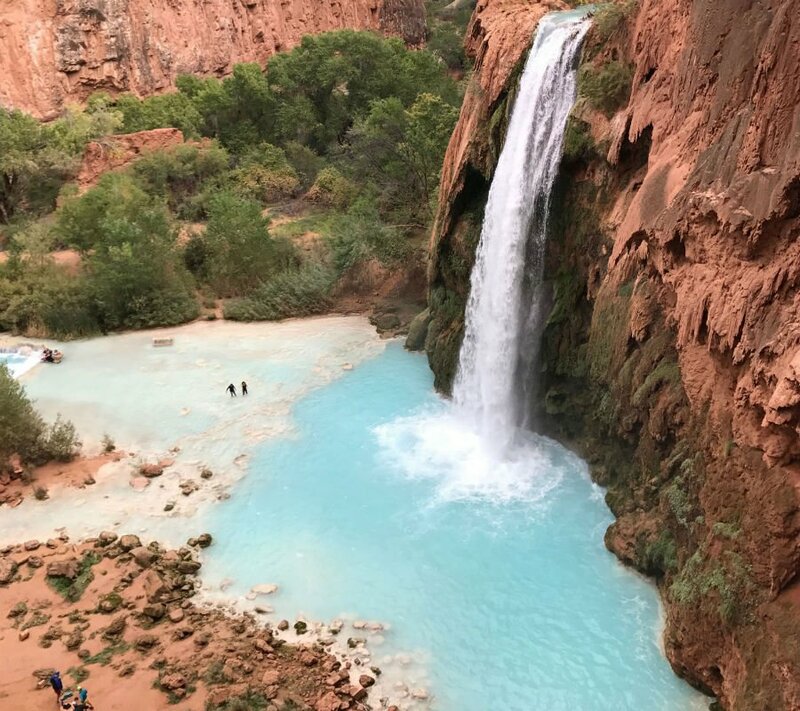 On the Havusupai Indian Reservation near Supai, lucky hikers who have scored the hard-to-come-by permit may trek ten miles to see and swim in its well-guarded turquoise waters. (The tribe begins selling camping reservations by phone on February 1. Some 250 slots are available each night. Within days, they sell out for the entire calendar year.) Why so blue? The spring-fed water comes into the creek from underground, where it picks up magnesium and calcium and carbon dioxide then flows in reflective limestone beds that do an incredible job reflecting sunlight. It's a color you're more likely to associate with the tropics — but there it is, surrounded by the dusty copper-colored desert of the American Southwest. Try your luck on the tribe's website.